8 voices may not be the final word. 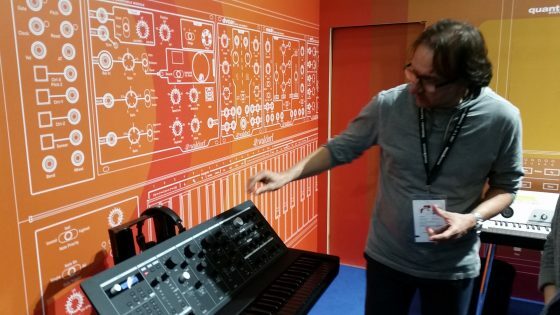 When I asked the developers why I wouldn’t get 16, they answered that the Quantum is definitely not the kind of machine that humbly produces all the bread-and-butter sounds for your run-of-the-mill dance track, and that you would get the type of sounds that don’t need to be hidden away in layers of synth padding. 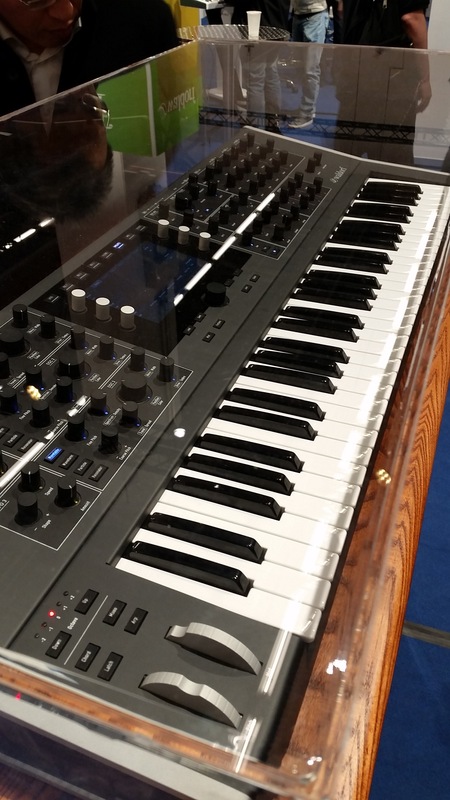 You wouldn’t want to play Rachmaninov on this synth either. In short, that sort of synth that sports eight voices, period. They seemed immensely proud on their achievement to me. They did not rule out that there MIGHT be a 16-voice version one day, or that they might revise the specification to 12 voices on the last meters. Two analog filters per voice – in parallel. The filters are built as filter cards, which means that there will be alternative cards with alternative filter types later on. The LEDs lighting the potentiometers are used to indicate the function of the knob, i.e. they change the colour to indicate the functional group of the knob. It looks much, much better in real than in a video. There are wooden cheeks available for those who want them, or feel the need to change the dress of their Quantum from time to time. And hey, there might even be a Blofeld-y white edition, you knever know, wink wink. The large screen in the middle is indeed a multitouch screen – No more menu diving – without having to break up the one-function-per-knob. 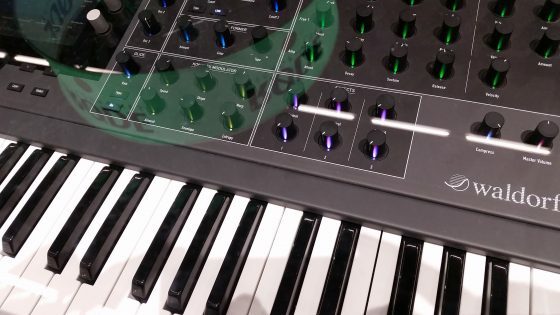 Although the interface does not seem to have very much in common with its Nave ancestor on the iPad, a lot of thought seems to have gone into it, and this is what makes this instrument unique. If you have a complex synth engine like Waldorf’s, and you don’t want to make the synth all but unusable by an overkill of knobs and buttons (yes, I am looking at you, Arturia Matrixbrute) you have basically two options: force the user to take a lot of infuriating menu dives (Blofeld), or deliberately limit the engine to give the user one-function-per-knob immediacy (Studiologic Sledge). The Quantum seems to pave a third way. 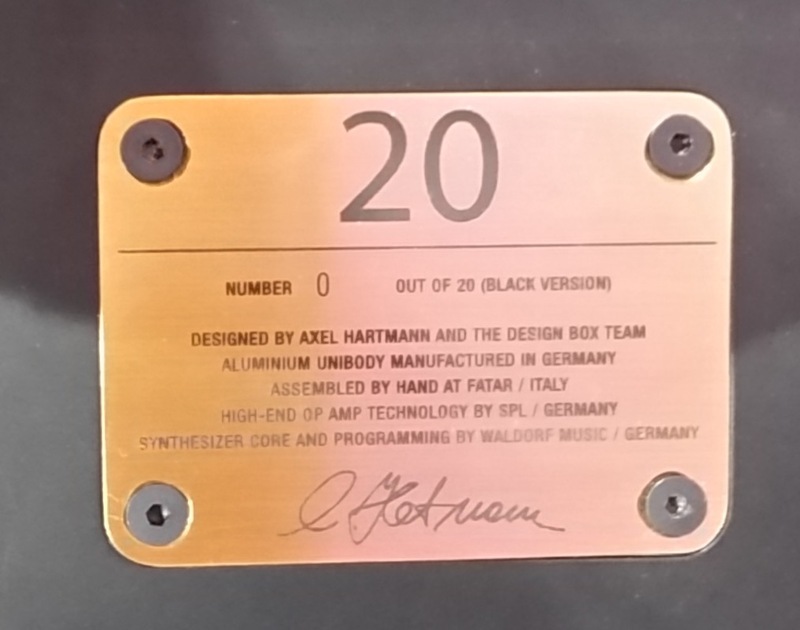 Talking of the Sledge: The “Up yours, poor people” version of this synth, the Hartmann “20”, was demoed by Axel Hartmann himself right next to the Quantum. Well yes, it’s extremely beautiful, which is I guess the least you can expect if you decide to shell out $20k for a middle-class VA synth, and the similarities in design between the “20” and the Quantum are undeniable. 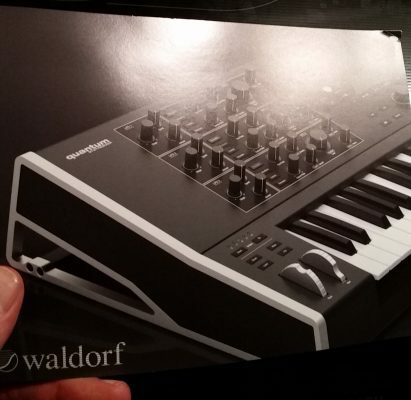 There are clear signs of a premium-market strategy here, and I guess you can’t fault them – if the synth market is anything like the market for cars or phones, the premium segment gives you the best returns, and is the best chance a small manufacturer like Waldorf has to survive. Although I fear that it might put the Quantum out of my reach. I guess I’ll stick with the Nave on the iPad and an X-Station template, then. And at least I will get to keep the leaflet. This entry was posted in Musik, Uncategorized and tagged Musikmesse, Studiologic Sledge, Waldorf Blofeld, Waldorf Nave, Waldorf Quantum by untergeek. Bookmark the permalink.